Caffeine is naturally present in coffee, tea, cocoa, guarana, and yerba mate, but it is also frequently added to sodas, energy drinks, and weight-loss supplements. Most of us consume some form of caffeinated beverage. In 2016 alone, people ingested 7 million tonnes of coffee, and the energy drink market is consistently growing. Before we get into the evidence on safe caffeine dosage, let’s see where all this caffeine is coming from. How much caffeine is in popular drinks? The infographic below features some of the more popular caffeinated beverages, with their caffeine contents. Keep in mind that, while the caffeine content of a given energy drink or soda is usually consistent from bottle to bottle, the caffeine content of coffee or tea can vary greatly. Caffeine’s safety is relative — it depends on the dose, of course, but also on your health. 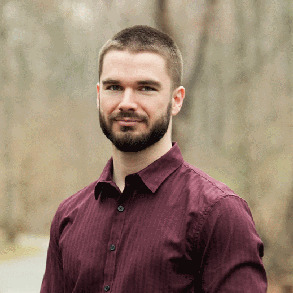 Some people display no unwanted symptoms from multiple cups of coffee per day, while others can’t drink one cup without experiencing abnormally high spikes in blood pressure, disrupted sleep, headaches, irritability, or nervousness (although some of the “jittery” effects may be alleviated with the co-ingestion of theanine). Interestingly, similar symptoms have been reported by people going through caffeine withdrawal, in addition to yawning, sleepiness/drowsiness, fatigue, lesser motivation to work, impaired concentration, impaired cognitive performance, flu-like symptoms, and muscle stiffness. In this article, we’ve broken down the recommendations on caffeine safety, but remember that these are guidelines — individual mileage may vary. The European Food Safety Agency (EFSA), the US National Academies of Science (NAS), and Health Canada have concluded that, for healthy adults, caffeine intakes up to 400 mg/day don’t raise any general health concerns. While you can consume more, 400 mg is how much caffeine most healthy people can regularly consume in a day without undue negative side effects. Further, the EFSA indicates that, for most people, up to 200 mg of caffeine at once doesn’t raise health concerns, even “when consumed less than two hours prior to intense physical exercise”. However, they caution that 100 mg of caffeine taken close to bedtime may affect sleep quality. Keep in mind that the half-life of caffeine is 5 hours (on average; it varies greatly between individuals), which means that you probably still have caffeine in your blood if you drank coffee within the last 10 hours. Healthy adults can safely consume up to 400 mg/day, but avoid caffeine near bedtime for optimal sleep quality. A review by the EFSA recommends that women who are breastfeeding, pregnant, or planning to become pregnant limit their intake to 200 mg of caffeine per day. Other reviews have concluded that 300 mg/day is safe, but you may be cutting it close, since taking more increases the risk of nausea and, worse, of miscarriage. Randomized controlled trials in pregnant or breastfeeding women are scarce, so erring on the side of lower caffeine consumption may be prudent, especially since the half-life of caffeine increases from an average of 3 hours for non-pregnant women to 10.5 hours during the last 4 weeks of pregnancy. In other words, when you are pregnant, your body takes a lot longer to get rid of the caffeine you consume: some of the caffeine you ingest in the morning is added to the caffeine you ingest after lunch, and so you may end up with a much higher dose coursing your body than you ever thought possible. Scientific reviews differ on what constitutes a safe upper intake for pregnant or breastfeeding women: either 200 or 300 mg of caffeine per day. The clinical evidence being scarce, it is advisable to keep consumption on the lower side of these recommendations. Other groups have called for even more research and caution in this population, particularly in regard to the caffeine content of energy drinks. The Health and Medicine Division (formerly known as the Institute of Medicine) has recommended that caffeinated drinks not be sold to children at school. In March of 2013, a group of scientists sent a letter to the FDA commissioner stating that “the best available scientific evidence demonstrates a robust correlation between the caffeine levels in energy drinks and adverse health and safety consequences, particularly among children, adolescents, and young adults”. The safe level of caffeine intake for children and adolescents is currently thought to be 2.5 or 3 mg/kg/day, but a number of organizations have called for more research in this area. Until more data can be collected, limiting children’s caffeine intake is advisable. It is well documented that caffeine can raise blood pressure for 3–4 hours (though this effect normally decreases with regular intake). Fortunately, in healthy adults, caffeine intakes of up to 400 mg/day have not been linked to increases in cardiovascular risk. But in people with high blood pressure or pre-existing cardiac conditions (in other words, in people for whom stimulants in general are contraindicated), the long-term effects of regular caffeine intake are less certain. Moderate intakes may be OK, but this should be assessed on a case-by-case basis in consultation with a healthcare provider. The cardiovascular risk of healthy adults doesn’t seem to increase with caffeine intakes of up to 400 mg/day, but in people with high blood pressure or cardiac health concerns, the long-term implications of regular caffeine intake are less clear — low to moderate intakes could be safe, but consult your healthcare provider first. How much can I drink before hitting the 400 mg limit? In order to track your caffeine intake, you have to be aware of the caffeinated beverages you drink and know their caffeine contents. 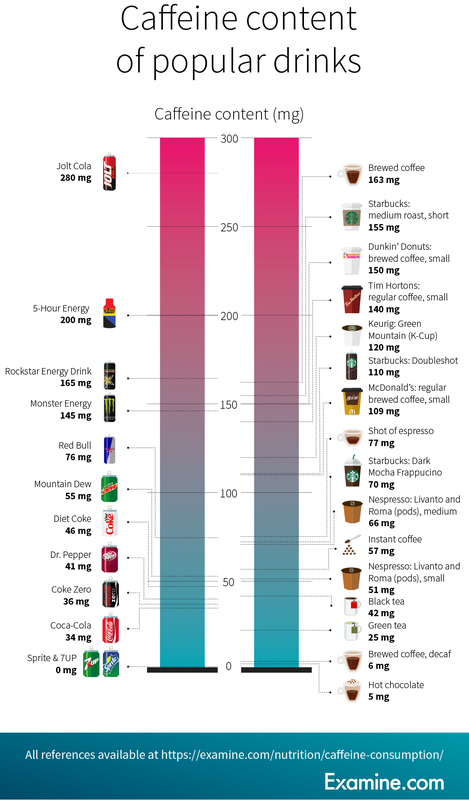 The infographic below features the same caffeinated beverages as the infographic above; it shows, for each kind of beverage, how much you would need to consume to hit the 400 mg/day threshold for caffeine. What happens if I ingest too much caffeine? With regard to oral doses of caffeine, 10 milligrams of caffeine per kilogram of body weight is considered toxic and 150 mg/kg can be lethal. So, for someone who weighs 68 kg (150 lb), toxicity starts at 1 g and lethality at 10 g. Therefore, yes, caffeine can kill, but a healthy person would need to drink in rapid succession dozens of the beverages shown above. Powdered caffeine is another story. The FDA warns that “one teaspoon of pure powdered caffeine is equivalent to the amount of caffeine in about 28 cups of regular coffee”. It is much easier to accidentally overdose on powdered caffeine than on caffeinated beverages. While poisonings or deaths caused by caffeine are rare, they do happen. Even specialists can make mistakes, as was seen in a Northumbria University trial that accidentally gave two students 30 g of powdered caffeine (equivalent to about 300 cups of coffee), when they should have received 0.3 g (300 mg). Both students survived, but they were hospitalized for some time. Unless you have a pre-existing heart condition, you run little risk of accidentally ingesting lethal doses of caffeine through caffeinated drinks, but you should steer clear from powdered caffeine. The upper recommended intakes covered in this article are based on the long-term effects of regular caffeine consumption. Doses over 400 mg (up to 800 mg) have been used in short-term studies on the performance-enhancing effects of caffeine. Such high doses might not hurt when taken on occasion, depending on the person, but the more frequent the occasion, the more likely you become to experience the downsides of caffeine. Furthermore, some of the benefits from caffeine fade with frequent intake, which is why some people choose to cycle caffeine. The occasional high dose of caffeine might boost your physical performance — but regularly exceeding your recommended upper intake can hurt your health on the long term. Moreover, regular use and infrequent use of caffeine offer different benefits, so cycling caffeine may be wise, depending on your fitness goals.